This pyramid is cast with the same proportions as the Great Pyramid of Egypt. It is sanded and polished on all sides revealing a marble smooth finish and high gloss reflection. The capstone and flower of life are cast in gold leaf and glow powder. There are multiple crystal layers in the pyramid including Kyanite, Labradorite, Amethyst and Turquoise. Inside the body of the pyramid are 5 Tibetan Quartz crystals surrounded with steel shavings. 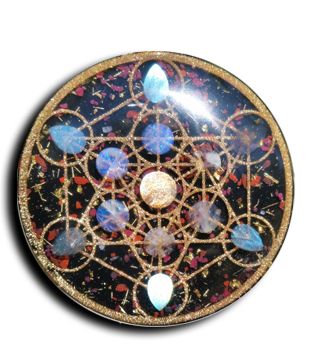 This creates a powerful orgone field where negative vibrations are purified into a harmonious state. Because of the shape of the pyramid, this device also stabilizes geo-pathic stress. Underneath the central crystal of the pyramid is a copper Tesla coil. Pyramid measures 5-6″ at the base 3-4″ base to tip.